This peak is located northeast of Squamish on the southwest corner of Garibaldi Park. Mount Garibaldi is a large dormant volcano, lying between the popular Garibaldi Lake area to its north and the Diamond Head area to the south. It has a small icefield to the east called the Garibaldi Neve which is frequently crossed as a 2 or 3 day ski trip. Visible from the head of Howe Sound, and from Squamish. 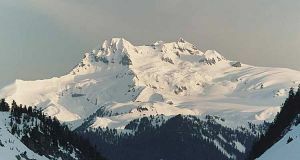 Atwell Peak on the south edge of the Garibaldi massif was first sighted by ship from Howe Sound. Mount Garibaldi was probably the first of the truly alpine peaks in the Coast Mountains to be climbed. Name Notes: Named Mount Garibaldi in 1860 by Captain Richards, of the Royal Navy, after Giuseppe Garibaldi (1807-1882) the great Italian patriot who that year had succeeded in unifying Italy. Recently several first nations names have also been created or discovered for the peak. One nameis Ta Nch'qai' (the "Grimy One"). Another one Chief Ian Campbell says that Squamish Nations' official name for the mountain is Nch'kay (pronounced Chuck-eye), same origin as Cheekeye.